This exclusive lodge is named for famed nineteenth century explorer and artist, Thomas Baines. The main area features an oversized deck for outdoor dining with views over the permanent water of the lagoon. Location: Located on a private concession neighbouring the Moremi Game Reserve. Set amongst the shady trees and water of the Okavango Delta, the small and intimate Baines' Camp features just 5 luxurious suites set on elevated platforms in the tree line. Wooden decks offer expansive views over the permanent water of the Boro River and a lagoon teeming with life. The elevated suites feature a spacious bedroom, with softly draped fabrics adding the romantic touch of a bygone era. 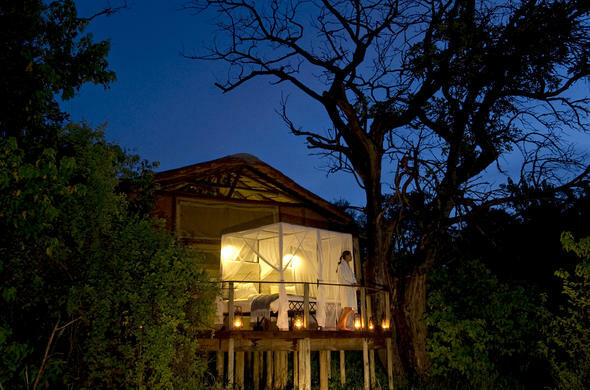 The four-poster beds are fully mobile, giving guests the choice of slumber under star laden skies. Avid astronomers will delight in stargazing from the privacy of their own deck. The main area features an oversize deck for outdoor dining with views over the permanent water of the lagoon, as well as a swimming pool for refreshing sunbathing. Malaria is a serious concern in northern Botswana. Please consult your doctor for the best prophylaxis. Bottled mineral water is supplied by the camp. Long sleeves and long trousers are advised for mornings and evenings due to mosquitoes. Children under 12 years are not accepted as the camp is unfenced and triple rooms are not offered.